IN September 2017, the Australian Bureau of Meteorology (BoM) claimed a series of new record hot days across south eastern Australia, including on 23 September at Mildura. At that time, the mainstream media reported this as a new record for the state of Victoria, specifically claiming it was the hottest September day ever recorded – all the way-back to September 1889. This claim, however, cannot be verified because the BoM uses a non-standard method for recording temperatures at Mildura, and furthermore the parallel data provided to me in December 2017 as proof of equivalence is flawed and deficient. On 23 September 2017, a new record hot day for Victoria was claimed at the Mildura airport using an electronic probe in an automatic weather station (AWS) housed in a Stevenson screen. The BoM claims that measurements from such devices are ‘comparable’ to measurements from traditional mercury thermometers, which were used to measure official air temperatures at Mildura from 13 June 1889 until 1 November 1996. There is no documentation, however, supporting this contention for Mildura or any of the other nearly 500 AWS spread across the Australian continent. Furthermore, the BoM does not have World Meteorological Organisation, or any other form of accreditation (i.e. ISO 17025) for any of its AWS. In addition, the BoM uses a non-standard method of recording temperatures from such devices. Specifically, while one­-minute averaging of one­-second readings is standard across the world (e.g. in India, UK, Germany, Holland, Switzerland, Saudi Arabia and Kuwait) the BoM records the instantaneous highest one-second readings from a probe as the maximum temperature for that location for that day. Given electronic probes generally respond more quickly to fluctuations in air temperature than mercury thermometers, it follows that this method – instantaneous recordings from an electronic probe – would result in new temperature maxima under the same weather conditions. The BoM, however, claims that temperature measurements from electronic probes are nevertheless ‘comparable’ with measurements from mercury thermometers because the BoM’s ‘purpose-designed’ probes ‘closely mirror’ the behaviour of liquid-in-glass thermometers, including the time constant. While this is theoretically possible, to know if it is being achieved in practice it is necessary to analyse parallel measurements i.e. data from an electronic probe and mercury thermometer operating side-by-side for a period of time. While the BoM has never released reports with parallel data supporting the claim of equivalence, in late October and early December 2017 a first and second lot of A8 forms were released to me – this followed my request to Minister Josh Freydenberg on 26 September for parallel measurements, and more specifically on 22 October for these A8 forms… immediately after I was informed by a whistle-blower that these forms contained the relevant information. After I manually transcribed and analysed relevant data from a subset of the first batch of over 4,000 scanned A8 forms received on 28 October, I wrote to Minister Freydenberg on 12 November explaining that the values recorded manually on the A8 forms from the mercury thermometers for the period November 1996 to December 2000 at Mildura are significantly different from the official values recorded from the electronic probes. Just considering the values for September, the mean difference is statistically significant at the 0.05 level of probability, and is +0.34 °C, +0.27 °C and +0.28 °C for the years 1997, 1998 and 1999, respectively. Somewhat surprisingly, the automatic weather stations at Mildura for these three Septembers recorded statistically significantly cooler temperatures than the mercury thermometers. Analysis of the second lot of forms, received on 4 December, has proven more problematic because of the quality of the available data, and absence of critically important data. The electronic probe that measured the record hot day on 23 September 2017 was installed on 27 June 2012 and I was initially told that there was parallel data only available through until January 2015. So, there is no reading from a mercury thermometer for Mildura for 23 September 2017. After scrutiny of the A8 forms actually provided, however, it appeared that the extent of parallel readings for the probe installed on 27 June 2012 would be limited to just the eight months July 2012 to February 2013… except that the BoM had omitted to scan September 2012 – the one month that could provide a direct measure of the equivalence of the relevant probe for that time of year at that location. After informing the BoM of this omission, I have been told it is being looked-into… that the relevant officer will follow-up on the missing month of data. Meanwhile, if we consider the residual available parallel data… the very hottest days according to readings from the electronic probe (30 November 2012, 18 January 2013, 5 January 2013, 8 January 2013, 6 January 2013, 1 December 2013, highest to lowest) have no equivalent reading from a mercury thermometer. In short, it appears that on the hottest days in Mildura – during the period that manual readings were being taken after installation of the most recent probe – no one was turning-up to take the manual reading from the mercury thermometer. As a consequence, the data for this period from the mercury thermometer is not normally distributed, as shown in Figure 1. 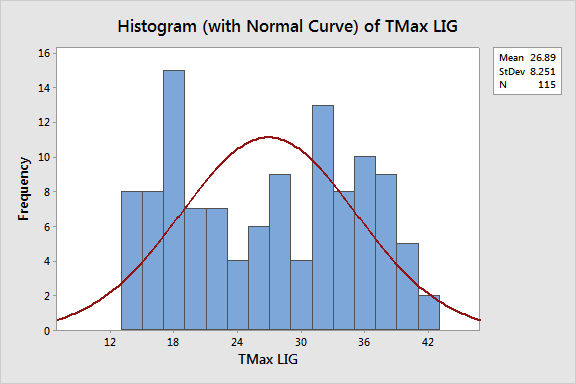 This makes statistical analysis using standard techniques impossible as assumptions implicit, for example in a standard paired T-test, are violated. Fig. 1. When the frequency of specific temperatures/data points as measured from the mercury thermometer at Mildura after July 2012 are plotted, it is evident that the data is not normally distributed. This makes statistical comparisons with measurements from the electronic probe problematic. 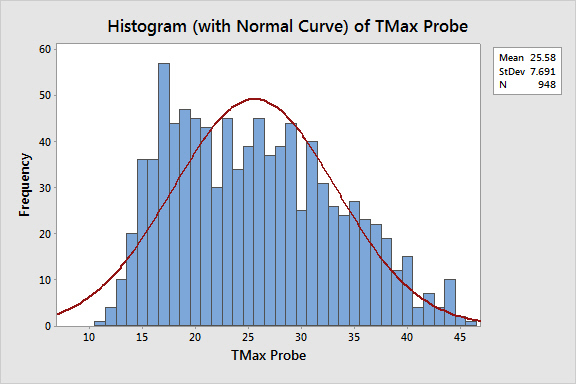 There are many more maximum temperatures measurements available for the electronic probe (n=948) than for the mercury thermometer (n=115), and the distribution is quite different, with a somewhat more normal distribution for the probe data, as shown in Figure 2. Fig 2. Distribution of measurements from the electronic probe recording in an AWS. Considering days when there is parallel data available in the temperature band of interest (the claimed-record hot day in September 2017 measured 37.7 degrees Celsius) the new probe has been found to measure up to 0.4 degrees hotter (e.g. 26 February 2013 the recording for the probe is 37.3, while the mercury thermometer recorded 36.9 on the A8 form). In fact, Table 1 shows that for the last month of available parallel measurements the electronic probe (Tmax-Probe) often recorded considerably warmer than the mercury thermometer (Tmax-LIG). While it is official BoM policy to ensure that there is approximately five-years of overlapping parallel data when there is a site move or equipment change at an official weather station, this policy appears to be rarely implemented. Indeed, while it would seem reasonable to assume that there would be dozens of reports detailing the results from such parallel studies – none have been made publicly available. In the case of Mildura, the quality and length of the available parallel data makes it difficult to draw any real conclusions about the equivalence of measurements from the electronic probe installed in July 2012, with measurements from earlier probes and/or the mercury thermometer first installed back in 1889. The issue of verifying the claimed record hot day on 23 September 2017 is compounded by the BoM’s method of measuring temperatures – in particular the absence of averaging over at least one minute which is standard for electronic probes. The second chart and table were added to this post the next morning (12 Feb. 2018) – to aid understanding, and add clarity. Well done again Jennifer, the lack of overlapping parallel data being made public and the method of measuring temperatures just shows how serious this million dollars a day BOM are about basic standards. When Peter Ridd shows the world what’s been going on in the scientific community, I hope the politicians who are sitting on their hands will start taking all these issues more seriously. Check and double check, review and test it. Obviously today’s scientists are too smart for the basics. I understand that parallel recordings allow you to understand whether the two types of thermometers are measuring the same temperature, but what is the point unless the thermistor temperatures are adjusted down to compensate. Do they do that at all? The Bureau have consistently said I am raising a non-issue: that there is no difference between the measurements from mercury thermometers and their electronic probes … while never providing any actual reports or data to back-up this claim. Until late last year when as a consequence of my badgering Minister Frydenberg, backup by Alan Jones on radio 2GB… and then a whistleblower telling me to ask for the A8 forms, we now finally have access to some parallel data for Mildura. This is a first! Table 1 in the above blog post shows that the electronic probe currently recording measurements at Mildura is recording warmer than a mercury thermometer would… this is not yet even acknowledged by the Bureau, there is certainly no adjusting down to compensate! PS The silence accorded the Bureau by the mainstream media for all of their indiscretions is much more complete than that ever accorded Barnaby Joyce. PSS I shall probably add to the above post (by way of an update) in the next day or two, with my most recent correspondence to the Head of the Bureau, Andrew Johnson. So why are they doing the parallel observations? It is a bit hard to fathom. And I noted that some of the temperature variations were within the range of the warming attributed to global warming over the second half of the 20th century. They should be taking, and reporting, parallel measurements to confirm that the probes are measuring the same temperatures as a mercury thermometer would. And they fail! 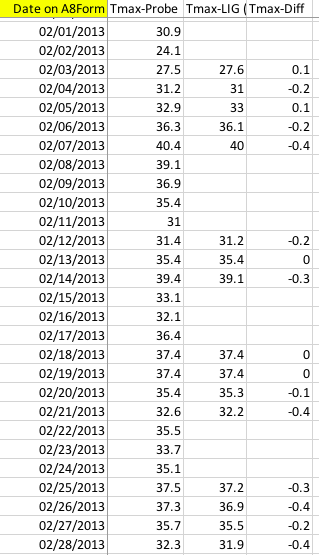 They do not adjust the data for differences in devices as they do not adjust the data for UHI. The adjustments only ever go one way. Jennifer, you have raised an extremely important point here about side by side verification testing, I wonder if any of the other bureau have the data? It might be worth asking Anthony Watts if he knows of any from his US Surface Stations Investigation. To me it appears that the bureau is either incompetent or deliberately misleading. Why would any bureau not use world’s best practice to measure temperatures? Why would you not have the 5 year comparison data available for validation or comparison? Given that the bureau has installed these probes in over 500 locations around Australia, you would assume that the proper comparative tests would have been extremely thorough, and performed at various sites of temperature extremes before they were widely introduced. Where is the data and analysis for these sites? Why is there so much secrecy regarding their testing equipment? They say that they have conducted their own tests/comparison, and their “electronic probe” is “comparable” to mercury. Really? Real life experience as shown in the graphs in the article tell us that the readings are not “comparable” at all. Even a mere pleb such as myself can see that the temperature readings are remarkably different, and always tending higher, not lower. The bureau needs a big shake-up from the top down. Good to see you still plodding on with this Jennifer. It seems like a nasty trick may have been played on you because it is likely that all the data was available in electronic form. If not, what did they record it for? How did they design a probe to match a glass thermometer without such a comparison and at which site? I have gone over some of the design steps that would need to be done and they are too complicated to trust without checking. If they revised the probe design several times there must have been some records kept of how, why and where. Perhaps they need to be asked the exact correct question and will give nothing away helpfully. Graham Young. The device they use is not a thermistor it works sort of similar to that by variation of resistance with temperature but is called a platinum resistance thermometer. The big difference is accuracy. They are very very accurate but taking a different time and or time curve shape to warm up and cool down means that for a rapid change in temperature they will accurately record a different value. They sample them every second but throw most of these measurements away keeping only the highest, lowest and last second from each minute. So it is possible that a brief transient change would be very different to an average over the same minute. It is also possible that the transient came from electrical noise and not temperature at all. imagine a nearby lightning strike producing a believable pulse. This is just the most obvious of many electrical noise possibilities. In my neck of the woods the BoM seem to be in the throes of replacing a long term, human attended, mercury thermometer and weather station with an AWS. They are not at the same site [about 2 klm apart] so it will be no comparison anyway but when they have this valuable historical data, why destroy it? This has happened in so many places. They need at least to admit that the change has happened and they cannot draw any scientific long term conclusions because of it. Good girl Jennifer. I am dragging up my old university stats to understand what you are on about. I have watched Peter Ridd on Sky and his revelations are very troubling but, to me, unsurprising. I have been smelling a rat for some years now. Keep at the BoM They need to understand that the comparison between technologies for temperature measurement are necessary public knowledge. Peter’s funding website is no longer accepting donations. Wouldn’t it be possible to simply put an electronic probe and a classic thermometer into a Stevenson enclosure or a temperature controlled environment for comparison? Digital photographs of the LIG thermometer at one minute intervals could be taken and compared to the probe. In a temperature controlled environment, with rapidly falling and rising temps it would be possible to demonstrate the lags caused by the thermal mass of the thermometer. Surely this would be easier than procuring and manually transcribing BOM records? I’m of the view, having casually observed the BoM 7-day forecasts vs actuals during this summer that there’s a constant 2C to 3C over-forecast by the BoM to the point that it has become a bit of a joke in our household. I wonder if this isn’t a psychological ploy to train people to over estimate temperature … 30C is going to feel like 33C all the time, phew it’s hot ! It is horrifying that a taxpayer funded organisation that is supposed to be cutting edge in its field is not following basic scientific principles of verification, normalisation and checking. Then, to discover new sampling stations are in different locations from the older ones but are assumed to be the same for temperature measurements is almost unbelievable. The BOM are employing clowns? Or is the right word illusionists? Whomsoever is in charge of this outfit must be a cowboy, and the workers presumably lazy cattle hands who just go with the flow. Manual checking a Mercury thermometer is ‘not my job’. Certainly not when temperatures are soaring! I suppose we should not be surprised when the public service employs nohopers and pays them better than those sharp shooters in industry. Moron Australis – here we come! Meanwhile, in the United States, (NASA boss and Mikey Mann champion) Gavin Schmidt and NOAA are busy adjusting the US surface temperature record to ensure its support for climate hysteria (while reflecting real world temperatures about as well as a fun house mirror). This was my thought exactly after reading Jennifer’s Spectator article. I am shocked that as late as the 90s and 2000s they were not taking every precaution in preservation of a national and world treasure. It seems like the record was in better hands when nobody knew it’s importance — they were just keeping the records for agricultural and meteorological history sake. Besides running concurrently for the when change in instrument this should have been done for at least five years for any change in siting. Knowing the value of the record as the basis for multi-trillion-dollar future policy decisions, how much is too expensive to leave a Stevenson box alone except to install a small remote camera to take the readings? Jennifer has hit onto an important point worldwide, especially the changes in sea surface temperature instrumentation and protocols (70% of the globe). We are in a sense pushing back against the Council of Nicea, that established the canon of the bible and authority of those who ran the church. Alternate translations, inconvenient texts, dogmas and theologies that didn’t fit….all were suppressed or censored. The BoM simply ignores the issues that have been literally documented. They simply shout louder the same flawed (or worse) story. This speaks volumes about their integrity and character.